Protesters outside the Bradford Commission meeting. Photo by Merrillee Malwitz-Jipson. 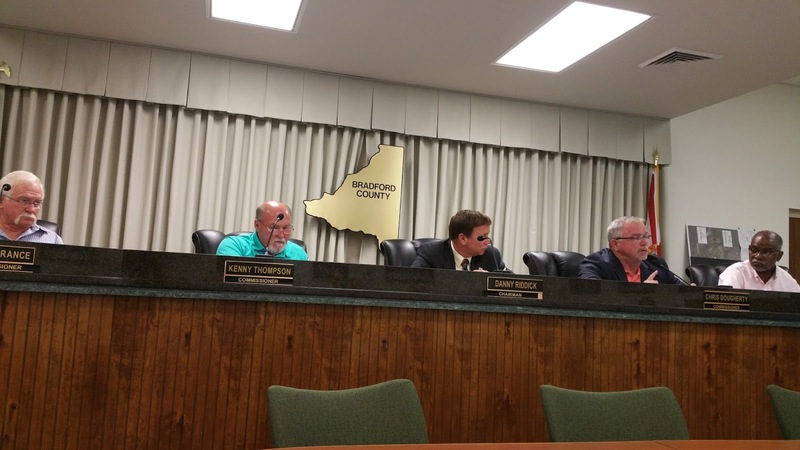 Facing dogged opposition, Bradford County Commissioners voted last week to hire an outside expert to review a proposed phosphate mine that threatens to pollute groundwater, rivers and springs in the region. HPS II Enterprises has proposed the mine on 10,000 acres in Bradford and Union counties straddling the New River, a tributary of the Santa Fe. Bradford County Commissioners listening to testimony. 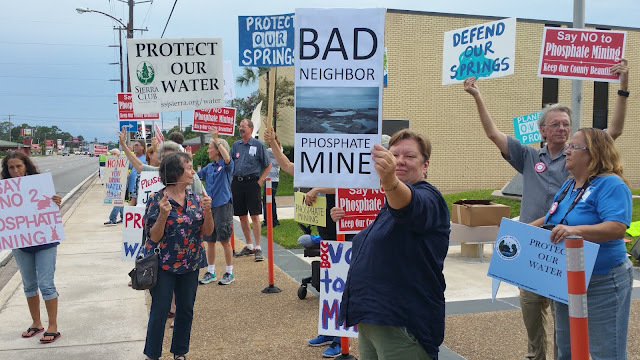 Close to 130 North Florida residents descended on the rural county, coming as far as Manatee, Polk and Hamilton counties to share their first-hand experiences with phosphate mining. 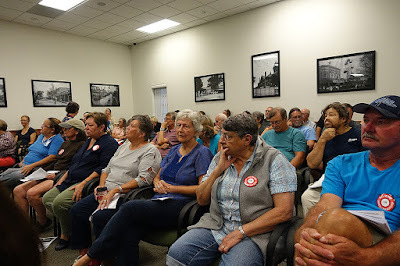 More than 50 people spoke against the project, many telling personal testimonies including damage to the water supply, health impacts and habitat destruction. Last year a giant sinkhole opened at a Mosaic phosphate mine in Polk county that polluted water with radioactive waste. Sierra Club Suwannee-St. Johns Group Chair Whitey Markle told the commissioners, "You're the first line of defense of your constituents' health and welfare." Residents united in opposition to the mine. Photo by Jim Tatum. Residents are gearing up for an impending Bradford County Commission vote on whether or not to approve the project. Union County has declared a mining moratorium as it reviews its land use regulations. Alachua County and five cities within Bradford and Union counties have passed resolutions against the mine. As protesters raised awareness outside the meeting, inside residents' impassioned pleas made it hard to imagine Commissioners walking away without being awestruck by a sense of responsibility to family, friends and neighbors. 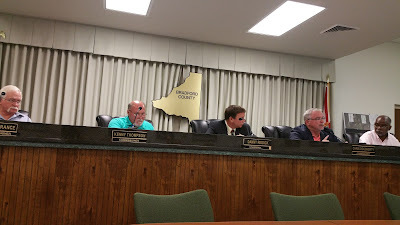 The Bradford County Commissioners listened to all the speakers with patience without divulging their personal opinion of the project. 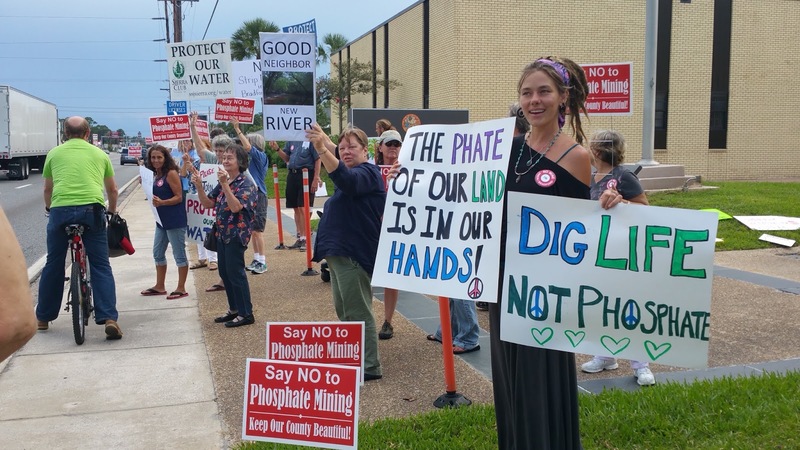 A coalition of groups including Our Santa Fe River, Citizens Against Phosphate Mining (CAPM), Florida Defenders of the Environment and Suwannee-St Johns Sierra Club have united in opposition to the mine. Sierra Club Suwannee-St. Johns Group Chair Whitey Markle addresses the County Commission. Photo by Jim Tatum. Protester holds sign saying "Dig Life, not Phosphate."